It has been difficult to end my task! the “quilt wannabe” lies, on one bed – unfinished, in quite a provocative manner. It is getting too big and too heavy and I am not sure about the combination of materials. I´ve been checking some sites, checking other peoples unwise ideas on quilting but couldn’t find anything similar. But the past weekend was rather nice. Gaetano joined us, from Italy, and designed some beautiful trims that are on the way to the fabric. I´promise to show it soon. I like them. And I liked spending time with him. Next time we will work on the softies. There was an interesting argument between the 2 of us. He can not understand why an object with no utility should be produced. 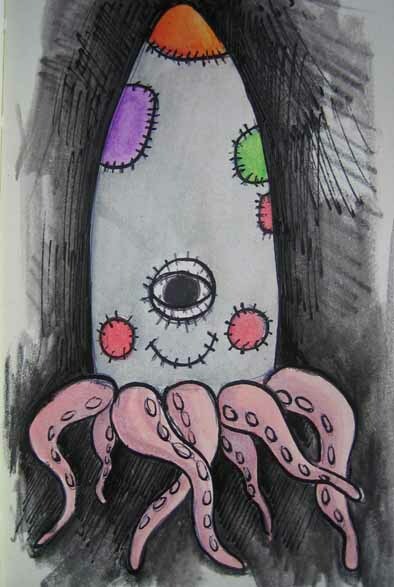 And even the squid he designed long time ago, and that I have always considered a funny doll and thought of ways of making it with that purpose on mind, well, I’ll make it alright, but we had to compromise – it is now going to be a sleeping bag!! Esta entrada foi publicada em CRAFT, knitting, quilting, softies. ligação permanente. this painting is awesome! is this on the quilt? I love the sleeping bag idea. and your dolls are fantastic. this makes me wanna get up and sew right now!